This is the story of a boy named Hassan Kadam (Manish Dayal) who grew up in Mumbai, India. It talked about his love affair with food and how he grew up to appreciate the different flavours and being able to master his craft in the kitchen. Fast forward to the present, Hassan and his family arrived at the South of France and bought a property which they intend to build a restaurant on. The challenge? It's a hundred-feet opposite the famous Michelin starred restaurant owned by Madame Mallory (Helen Mirren). Will they be able to succeed? For one thing, this is a movie that you shouldn't watch with an empty stomach or without any snack on hand. Trust me. 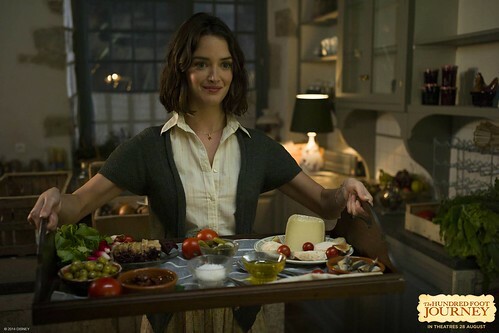 On the first 10 minutes of the movie, I felt my mouth water as soon as Marguerite (Charlotte Le Bon) came out on screen with a huge board topped with cheese and bread. Luckily, I went prepared with my Egg Mayo with Honey Mustard and Sweet Onion Vinaigrette Wrap to munch on. 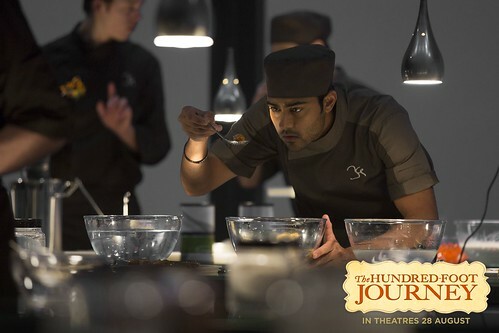 The Hundred-Foot Journey stars Helen Mirren, Om Puri, Manish Dayal and Charlotte Le Bon. What makes it interesting is that it's produced by Oprah Winfrey, Steven Spielberg and Juliet Blake.